During the last two weeks, volatility in the gold market moved up dramatically. Prices dropped quite fast and heavily between $60 and $80 twice. Both times, the sell-off started in the late hours of the Asian trading session while European and American traders were still sleeping. Slowly but surely powers are shifting from west to east. At the same time, gold was able to reach a new all-time high at nearly US$1,238 followed by a sell-off down to US$1,149. With this action in place, the strong up move during the last couple of weeks is very likely to be interrupted. But it’s not the end of this midterm rally. I am still holding on to my price target of US$1,600 until around March 2010. Gold will probably consolidate the massive up move since the last low at US$1,025 in a triangle over the next one to three weeks. Whether the low at US$1,135 is already in place can not be said yet—but it seems to be likely. On the 1h and 4h charts, the indicators are already deeply oversold. The correction will go on, further and deeper. The maximum downside potential is the old high at US$1,070. But the 50d MA (US$1,090.65) is already higher; therefore, I don’t believe it is very likely that gold will move below US$1,100. Remember: everything is possible in the markets. If gold closes below US$1,135, that would be a big warning sign. 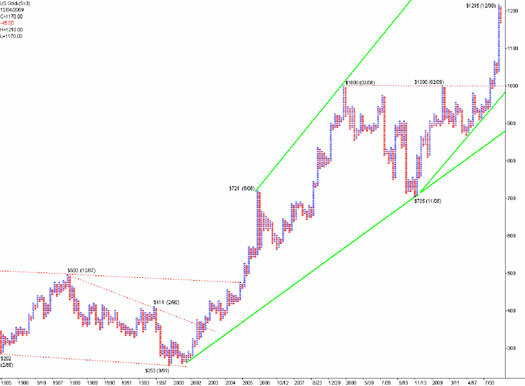 If the US Dollar seems to break out from a wedge to the upside, then we could see a serious rally. If this happens, the gold rally probably will be over for now. 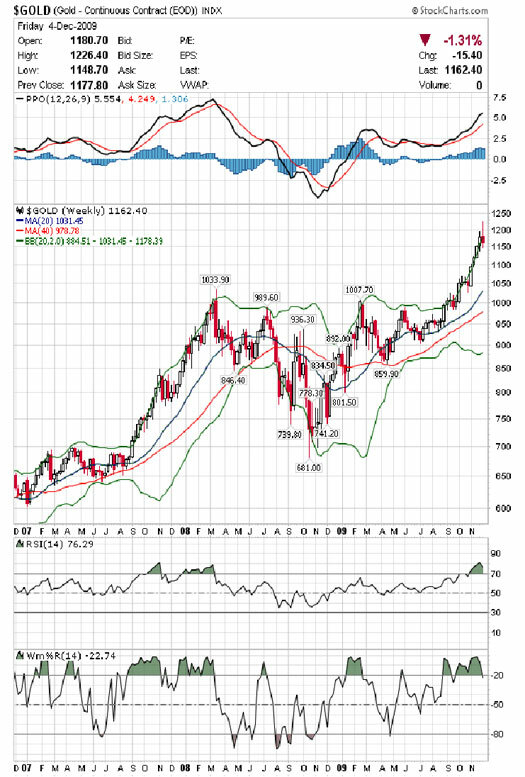 The 200d MA (US$976.88) still indicates a bull market and probably will be seen in the spring as a line of support when the traditional spring correction occurs. 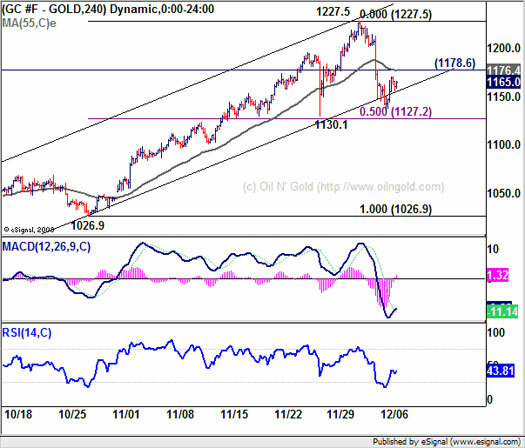 The following 4h chart shows the lower support line around which gold is currently oscillating. The following Point and Figure Chart graphs the last 25 years. It always amazes me how well these kinds of charts work. With this chart, you would have had no sell signal until last Friday and could have made nearly US$200 in the last up move since the low at US$1,025. The ratio for the Dow Jones Industrial Average gold price is 8.94. The stock market is not yet out of the woods, and we could see a continuation of this sideways movement. Also, there is the typical year’s end rally around the corner. Very long term, I expect the price of gold to move towards parity to the Dow Jones (=1:1). The next primary cyclical change is still years away. This means we are still in a long term bull market in gold (and also commodities) and in a secular bear market in the broader stock markets. Gold in EUR started the correction as well last Friday, but further downside risk should be limited. 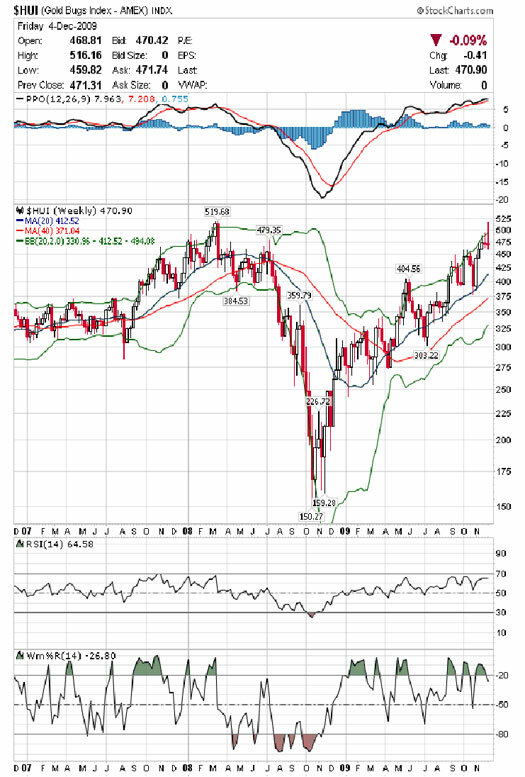 Already the mid Bollinger Band (770?) is good support. If that level does not hold, then we should see a bottom around 740-750?. The 50d MA (731?) and the 200d MA (694?) are far away and rising slowly. The current correction is probably the last opportunity to accumulate gold well below 800?. The chart of the HUI is less impressive than the chart of gold. The sell-off on Friday was severe. 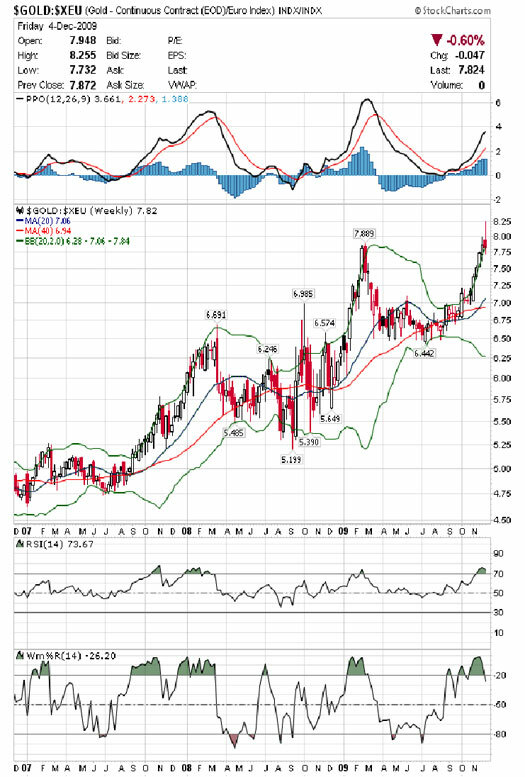 A pullback around the all-time high at 520 points was to be expected as mentioned in the last issue, but the performance of the gold mining stocks is pretty disappointing. Due to the miners’ high volatility, gold mining stock investors have not had it easy; however, if gold rises to US$1,600, their patience and strong nerves will be rewarded. 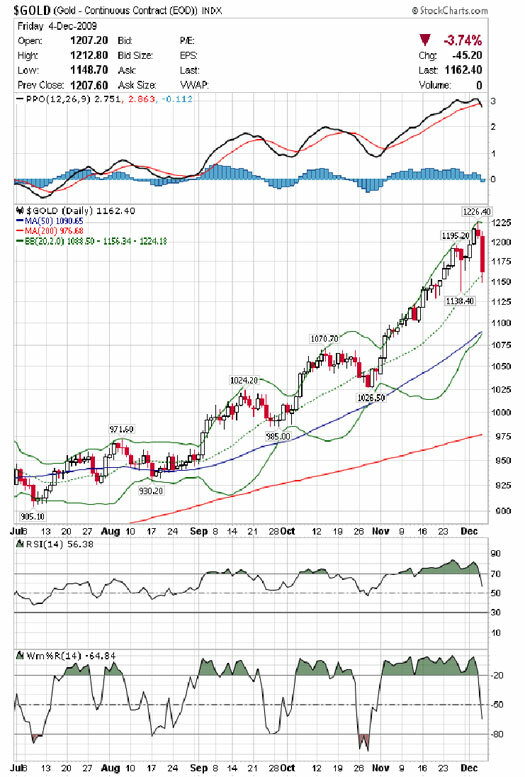 The area around 460 points is a very strong support—it should hold. But you can also expect that new HUI highs will take some time. It is most likely that HUI will consolidate between 460 and 510 for a while. But, of course, one can also interpret the disappointing performance of the HUI as a negative signal for the current gold rally. But as long as gold holds above US$1,135, I think this point has low relevance. 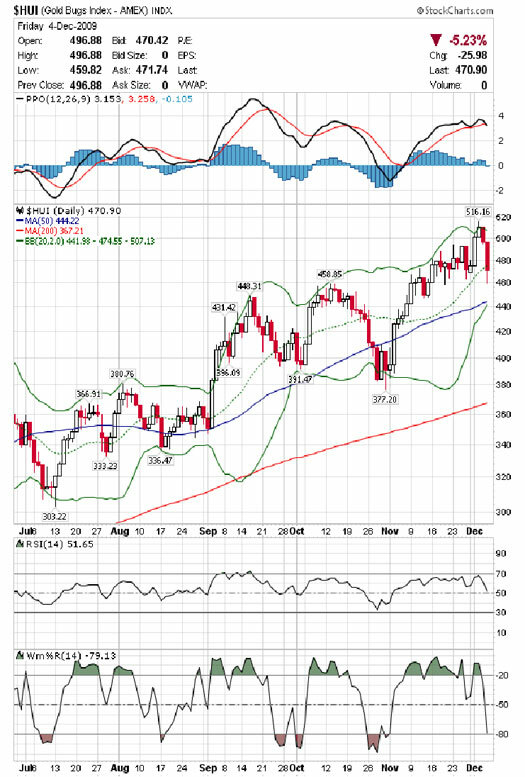 Another negative point is the rising RSI–divergence and exhausted MACD/PPO indicator on the weekly chart. 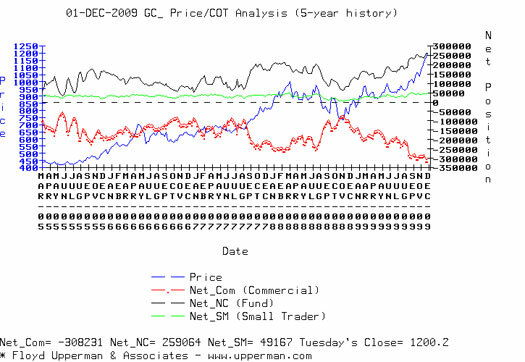 Although gold went up more than US$200, the commercials really did not increase their short position significantly. The sell-off on Friday probably was already used to cover some positions. Seasonality is still positive and supports higher prices within the coming months. Some commentators have already interpreted the current correction as the end of the gold rally. The sentiment indicator is changing quite quickly here. It is necessary to cool down sentiment before the next up move can start. The next big up move in the multiyear gold bull market has been underway since late August. We will see much higher prices in the coming weeks and months. My price targets have not changed: US$1,250 until the end of the year and US$1,600 until spring next year. Every pullback is an opportunity to buy. The volatility will increase dramatically. 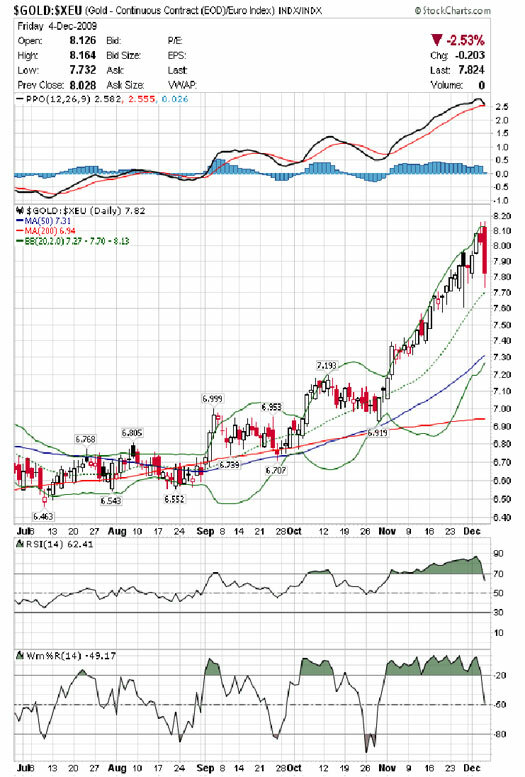 Intraday moves of US$50 - US$100 are realistic and to be expected.